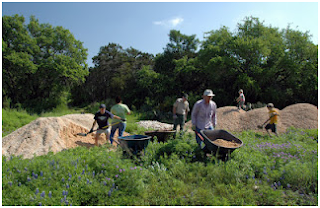 The San Marcos Greenbelt Alliance and Texas State University partnered for the 10th Bobcat Build. SMGA participated with the University for most of the community service annual events. This year, like last, was centered at Prospect Park, a connector greenspace in the larger 463 acres Purgatory Creek natural area. 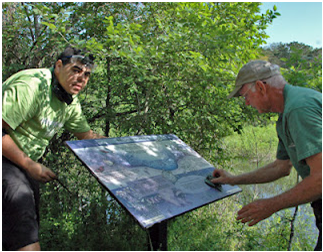 John Garcia and Ken Gees attach the wetlands interpretive sign. 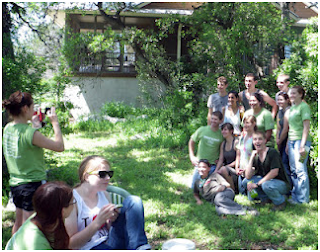 “The students in my group were extremely hard working as were all of the individuals there. When they return to Prospect they will look at it through different eyes, as do all of us with sweat equity!” said JoEllen Korthals. She lead a group clearing the fence line between the wetlands ponds and the meadow. Several invasive or aggressive plants had overgrown the fence line and anacua trees. Mark Taylor pushes limestone as the crew loads more wheelbarrows. After all the hard work time for photos and pizza.